Amazing Dinosaurs! is a new traveling exhibit that presents a fresh and exciting learning experience. Explore unique interactive displays to discover and touch authentic fossils and casts from many favorite Jurassic and Cretaceous dinosaurs! Experience the feel of real bones and teeth from T. Rex, Triceratops, raptors, big longneck sauropods and duckbilled dinosaurs! A centerpiece of the exhibit is the 'Geologic History of Earth' that provides visitors a fascinating interactive journey through time. Which animals lived when? 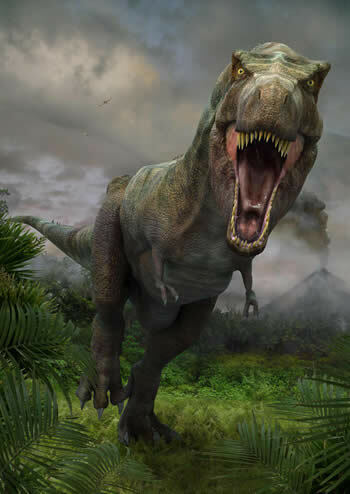 Did a Tyrannosaurus Rex ever meet a Woolly Mammoth? Be transported back in time to an era long before humans were the dominant species on Earth and experience the thrill created by life-like recreations of many of your favorite prehistoric creatures. This exhibit is designed to be flexible in size and configuration while offering the option to replace or add new animals during the course of an exhibition period. Amazing Dinosaurs! It's here now! Ice Age Imperials is a traveling museum exhibit that tells the story of the Ice Age. Its exciting interactive displays make the drama of the gigantic mammals that dominated the age accessible to all. Focused on the flora and fauna of North America's Central and Eastern regions, Ice Age Imperials provokes visitors to wonder: When and where was it? What was life like here during the Ice Age? How do today's animals compare to their extinct Ice Age relatives? The exhibit provides unique opportunities for visitors to 'touch the Ice Age' , interacting with real fossils from ancient animals like sabertooth cat, woolly mammoth, giant sloth, dire wolf, giant beaver and Ice Age bear. 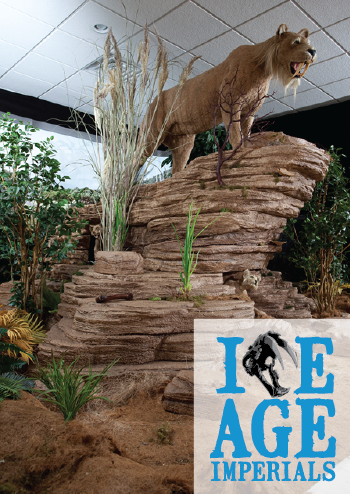 A variety of learning activities make the Ice Age come alive to visitors like never before.